Propylene, also known as Propene, is the second most important petrochemical feedstock: About 85 million tonnes of propylene were processed worldwide in 2013. Direct applications include besides the plastic polypropylene (PP) the production of important chemicals such as propylene oxide, acrylonitrile, cumene, butyraldehyde, and acrylic acid. With this new market study, Ceresana offers transparency regarding the development of the entire global market for propylene and propylene-derived products. It analyses important recent influential factors in detail, for example the consequences of the shale gas boom in the USA and the increase of capacities in China. This market report also provides details on the propylene industry, market trends, market size and market growth. Forecast cover the time up until 2021. A large share of global propylene output originates as by-product of ethylene manufacturing (-> see also market study Ethylene by Ceresana) using steam cracking or is produced using catalytic cracking in refineries. As a result of an increasing use of ethane, steam crackers produce more and more ethylene and less and less propylene. But thanks to a more widespread use of on-purpose technologies, the supply situation on the global market for propylene is likely to relax. This development is expected to lead to a stabilization of prices for propylene. Worldwide revenues generated with propylene are expected to continuously increase by 5.3% p.a. between 2013 and 2021, and thus at much lower growth rates than in the previous eight year period. The most important of the on-purpose technologies for the production of propylene is the dehydrogenation of propane (PDH technology). Given an increasing price differential between propylene and propane, this technology is becoming more profitable not only in countries with extensive gas resources. Both the USA and China will put several PDH plants on stream in the future. Production potential for propylene will rise accordingly. Supported by the new PDH plants, propylene production in North America will rise significantly in the future after output fell between 2005 and 2013. The highest growth rates, on the other hand, we forecast for Eastern Europe, where development will be dominated by Russia, and the Middle East. Western Europe, however, will suffer the combined effects of increasing international pricing pressure and weak demand development: Ceresana is expecting a reduction of capacities and hence a decline of production volume. As a result of the limited Chinese crude oil resource, manufacturers of propylene are dependent on imports. Output of non-crude oil based propylene products is to be increased considerably in the future. In order to achieve this goal, new CTO (coal to olefins) and PDH plants will be put on stream. According to analyses of Ceresana, Chinese production will thus increase by up to 8% p.a. in upcoming years. Due to a rapid surge of demand, however, China will continue to import large amounts of propylene. The by far largest share of global propylene output, about two thirds, is processed into polypropylene (PP). Demand for this plastic is projected to increase by 3.7% p.a. until 2021 and will therefore dominate demand development on the propylene market. Polypropylene is one of the most versatile packaging materials. Other applications include fibers, textiles, vehicle parts, electrical devices and household goods. Second largest sales market for propylene is the production of propylene oxide, followed by the manufacturing of acrylonitrile, butyraldehyde, cumene, and acrylic acid. The derivatives of propylene oxide are needed as raw materials for the manufacturing of products like polyurethane (PUR), lacquers and adhesives, polyester resins, cooling agents, antifreeze, and solvents. In addition to the production of the engineering plastic acrylonitrile butadiene styrene (ABS), acrylonitrile is also used to produce acrylic fibers that are then processed into textiles. Butyraldehyde is an intermediate in the production of butanol and 2-ethylhexanol. Cumene is mainly used to manufacture phenol and acetone, and is therefore also a precursor for bisphenol A, phenolic resins, caprolactam, and methyl methacrylate. Acrylic acid is used in the production of acrylic esters for superabsorbers (superabsorbent polymers, SAP). Chapter 2 examines the 29 largest countries of the market in more detail and provides information on demand, revenues, production, import, and export of propylene as well as capacities. Demand for propylene is analyzed in detail split by the applications polypropylene (PP), propylene oxide, acrylonitrile, butyraldehyde, cumene, acrylic acid and other applications. 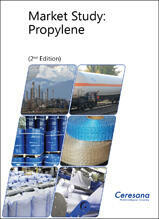 Chapter 3 provides a detailed analysis of applications for propylene, e.g. its use in the manufacturing of polypropylene (PP) and in other applications. This study contains data on demand development, split by Western Europe, Eastern Europe, North America, South America, Asia-Pacific, the Middle East and Africa as well as consumption figures for individual countries in these regions. Chapter 4 is a useful directory of propylene producers, clearly arranged according to contact details, turnover, profit, product range, production sites, profile summary, product-specific information as well as existing and future capacities at individual production sites. Extensive profiles of 126 manufacturers are provided, including Braskem, Enterprise Products, ExxonMobil, Formosa Plastics, LyondellBasell, Reliance Industries, Shell, Sinopec, Total and Valero Energy.